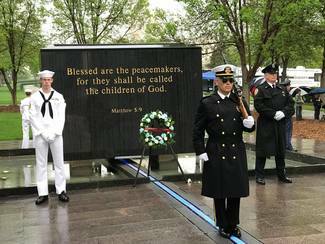 Thank you for participating in this year's annual Law Enforcemement Memorial Day Standing of the Guard Ceremony to be held at the Minnesota Peace Officers Memorial. PLEASE NOTE THIS CHANGE: This year every person registering to Stand Guard must do it individually. Slots cannot be secured in blocs as in previous years. * Register for a timeslot for the Standing of the Guard. Each slot will be for 20 minutes beginning at 7:00 p.m. on May 14th and ending at 7:00 p.m. on May 15th. We ask that each membrer of your agency, department or organization sign up indiviudally. * Purchase a Memorial Wreath on behalf of a fallen Peace Officer: Prior to the order of a wreath you purchase will be contacted by a member of LEMA to determine the date, time and officer you would like to have the wreath presented, as well as the color choice of your wreath -White, Red, Blue or Red, White and Blue.